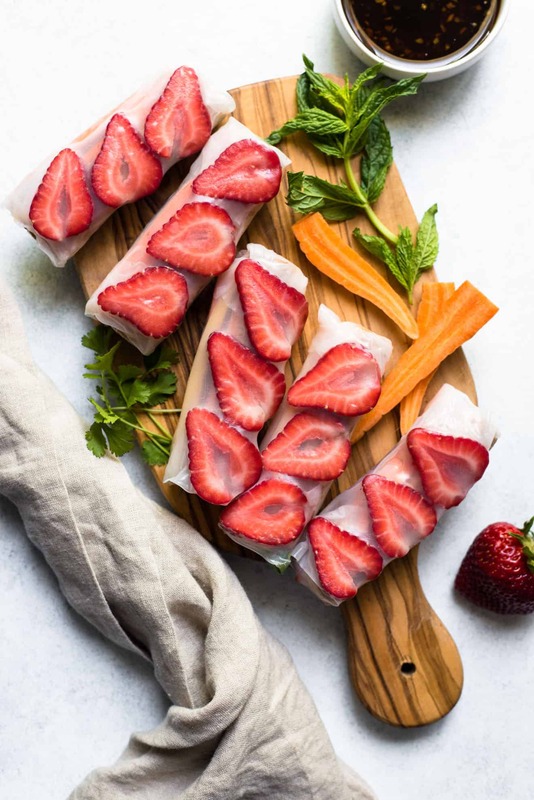 These fresh teriyaki tofu spring rolls are filled with vegetables, herbs and sliced strawberries! They are great for a light meal. You can also double up this recipe and serve it for a party. I absolutely love eating spring rolls in the summer. When it’s hot out, I only want to eat something light and fresh for dinner, and these spring rolls fit that bill exactly. 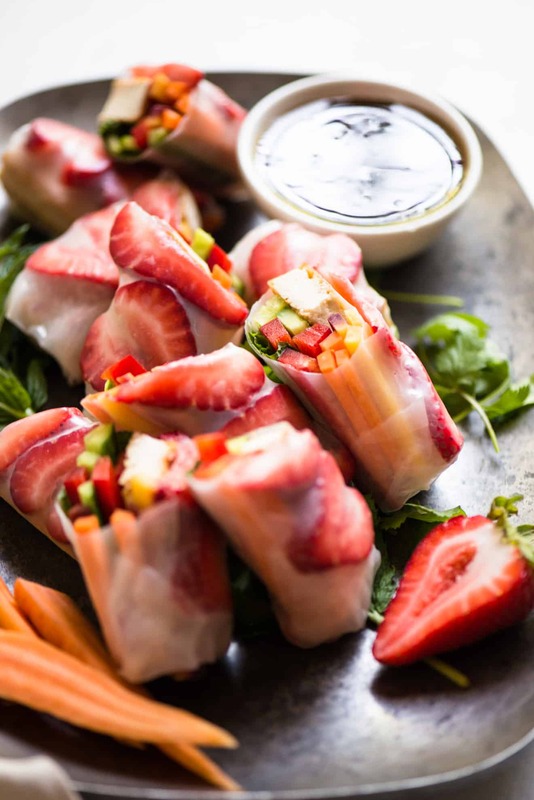 They’re filled with vegetables, herbs and sliced strawberries and you can taste the flavors of these fresh ingredients with every bite. Usually, Vietnamese fresh spring rolls are made with a grilled protein (often times, shrimp), vegetables, fresh herbs and rice vermicelli noodles. I wanted these spring rolls to be vegetarian and light, so I swapped the shrimp for tofu and added more vegetables. Of course, you can add vermicelli noodles if you want the spring rolls to be more filling. Personally, I liked tasting all the fresh ingredients in the spring rolls, so I barely used a dipping sauce when I ate them. 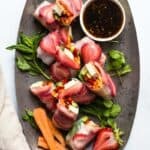 If you think that’s a bit bland, you can dip the spring rolls into the extra teriyaki sauce or try my sweet chili sauce that’s listed in the recipe notes. The flavors of the teriyaki sauce are quite intense, so you probably don’t need a lot of it for dipping. Rice paper wrappers: For these spring rolls, I’m using rice paper wrappers that are 22 centimeters (about 8.5 inches) wide. You can use wrappers that are smaller or larger, but you will have to adjust the amount of filling on the inside. If you use larger wrappers, you’ll probably need to fill each spring roll with 2 strips of tofu. Wrapping the spring rolls: One of the trickiest parts about wrapping spring rolls is determining whether the rice paper is prime for rolling. First off, if you see rips or tears in the dry rice paper, just set it aside and don’t use it for making spring rolls. Next, don’t moisten the rice papers too much. Overly soggy wrappers make it very difficult for you to roll up the ingredients. All you need to do is lightly dip the wrapper into a bowl of lukewarm water and get the entire surface area moistened. Then, transfer the wrapper onto a wet cutting board. The moisture of the cutting board will soften the wrapper even more. If you notice that the wrapper is still quite stiff when you are ready to roll, just leave everything on the cutting board for another 15 seconds or so. The paper will soften over time. If you notice that the rice paper is clinging to the cutting board when you are rolling, it means the cutting board is too dry. Just splash some more water on the board. Stickiness of rice paper: When you grab a spring roll off a plate, you might notice that the rice paper gets stuck. To prevent the sticking, you can line the plate with parchment or wax paper. I don’t usually bother with this step because I eat the spring rolls immediately after I make them, when the rice paper is still quite pliable. The spring rolls do want to stick onto the plate, but will come off without ripping. Pressing the tofu: For this recipe, don’t press the tofu before pan frying because it’s not necessary. If anything the pressing can make the tofu block lopsided, which is not ideal for cutting into strips for the spring rolls. 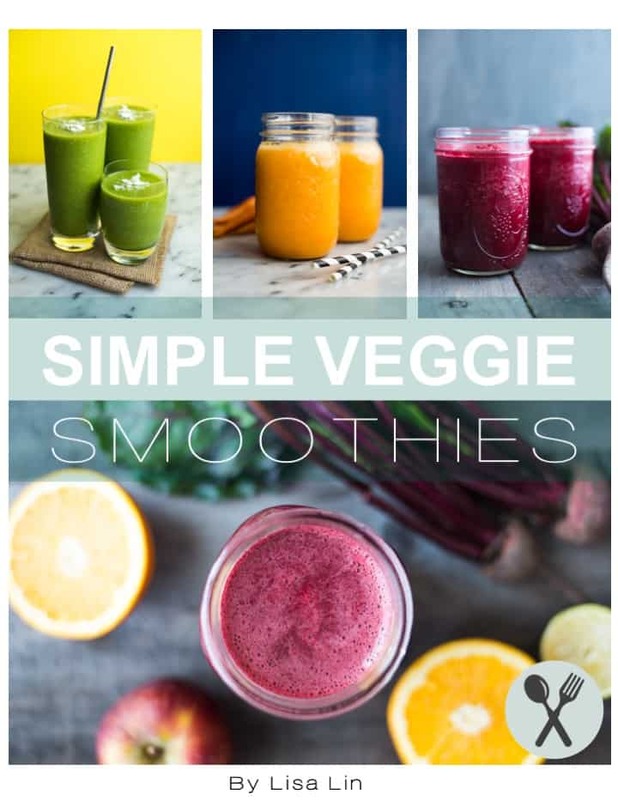 In this recipe, I’m using carrots, red bell peppers and cucumbers, but you can use whatever vegetables you have on hand. If you are looking for other ways to use the teriyaki sauce, try my teriyaki chicken lettuce wraps (my recipe shared on Simply Recipes)! Wrap the block of tofu around a layer of paper towels and let it sit for 15 minutes. Add all the ingredients into a small saucepan and stir until the cornstarch dissolves. Heat saucepan over medium heat until the sauce starts to boil. Reduce the heat a little and let everything simmer for 2 to 3 minutes. Remove the sauce from heat. Slice the block of tofu into 5 planks. Heat the oil in a large non-stick pan over medium heat. Add the tofu and pan fry for 5 to 6 minutes, until the tofu is golden brown. Resist the urge to flip the tofu before it’s golden brown because the tofu will stick. Flip the tofu and pan fry the other side for another 5 minutes. Remove the pan from heat and pour 3 to 4 tablespoons of the teriyaki sauce over the tofu. Be careful as the teriyaki sauce will splatter in the hot pan. Spread the teriyaki sauce over the tofu planks and flip them over to distribute the teriyaki sauce. Let the tofu cool for 10 to 15 minutes. Slice each plank of tofu into 3 strips. Transfer the tofu on a plate. Get your workspace organized. Fill a shallow, wide bowl with lukewarm water. Lightly wet the surface of the cutting board. Place the vegetables and tofu on plates or bowls and get them close to your workspace. Have a large plate ready so that you can place your finished spring rolls on top. 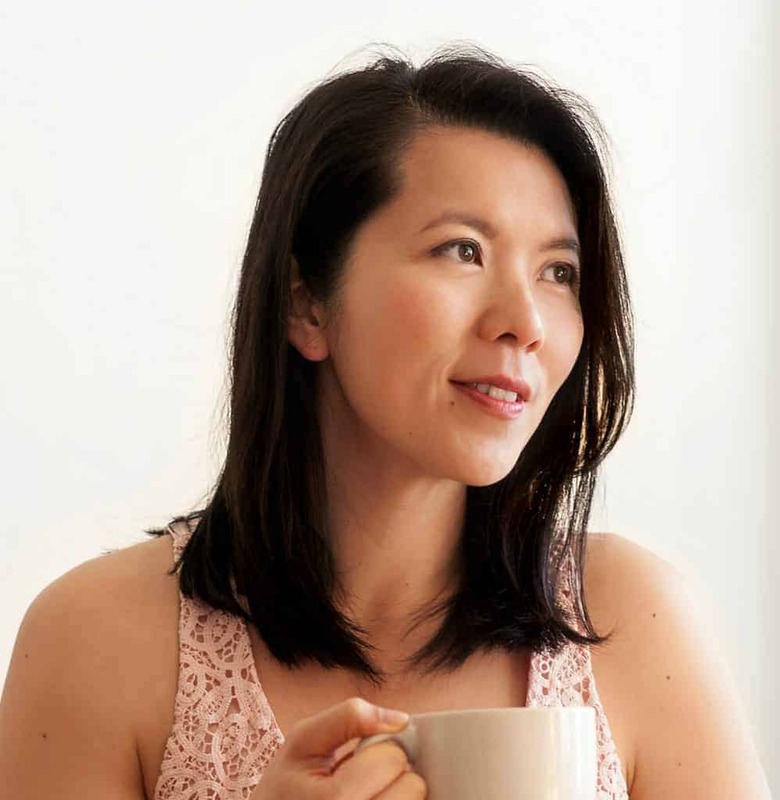 Dip a rice paper wrapper into the bowl of water and circle the paper around so that the entire surface is moistened. Transfer the rice paper onto the wet board. Place a strip of tofu and a few strips of the carrots, pepper and cucumber about 1/2 to 1 inch away from the bottom of the wrapper. Top with a few mint and cilantro leaves. Arrange 3 slices of strawberries about 1 1/2 inches away from the tofu and vegetables. The spring rolls are best served within the next hour. 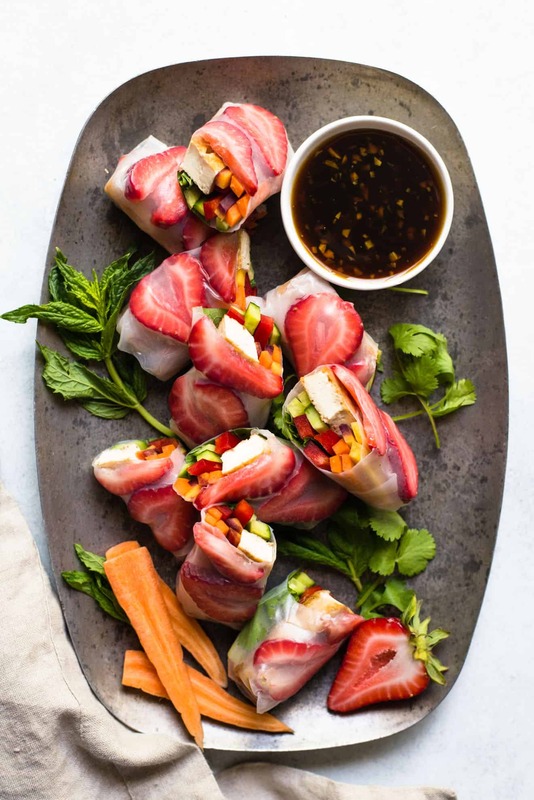 If you planning to serve these a few hours later, transfer the spring rolls to a plate or platter that is lined with parchment or wax paper. Cover the plate or platter with plastic wrap until you’re ready to serve. You can serve the spring rolls with the remaining teriyaki sauce or a sweet chili sauce (see notes for recipe). Sweet Chili Sauce: (Ingredients) 1/2 cup honey, 1/2 cup water, 2 tablespoons rice vinegar, 2 teaspoons cornstarch, 1 clove minced garlic, 1/2 teaspoon salt, 1/2 teaspoon red pepper flakes; (Instructions) Mix all the ingredients in a saucepan. Bring to a boil. Reduce the heat and let the sauce simmer for 5 minutes. Turn off heat and let the sauce reach to room temperature before serving, about 30 minutes. If you notice that the rice paper is sticking to the board, moisten the board with more water. If you don’t have mirin on hand, you can substitute it with a white cooking wine.